The latest game changer in diabetes research might not be a new drug or a therapy. Instead, it could be a system of human blood vessels virtually identical to the ones currently transporting blood throughout your body. What makes these blood vessels special is that they are the first ones grown in a lab — and they’ve already generated a new lead in diabetes treatment. When a person has diabetes, their blood vessels often exhibit an abnormal thickening of what’s known as the “basement membrane.” This thickening impairs the transfer of oxygen and nutrients to cells and tissues, which can cause a plethora of health problems ranging from kidney failure and blindness to heart attacks and strokes. In a study published in the journal Nature on Wednesday, researchers from the University of British Columbia detail how they were able to coax stem cells into growing into human blood vessel “organoids,” the term used for three-dimensional, lab-grown cellular systems that mimic the characteristics of organs or tissues. 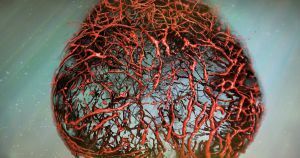 They then placed the lab-grown blood vessels in a petri dish designed to mimic a “diabetic environment.” They found that the basement membrane thickened in a way that was “strikingly similar” to the thickening seen in patients with diabetes, according to researcher Reiner Wimmer. The researchers then went on the hunt for a chemical compound that could prevent this thickening in their lab-grown blood vessels and found one: an inhibitor of the enzyme γ-secretase. The team’s study suggests that inhibiting γ-secretase in patients could be a helpful diabetes treatment, but according to researcher Josef Penninger, there are potential uses for lab-grown blood vessels far beyond diabetes research.